The Texas Hawking Association (THA) is a non-profit 501-C(7) member-supported social organization that serves licensed falconers, individuals interested in becoming a falconer, and anyone with a general interest in falconry in Texas. The THA strives to provide its members and the falconry community as a whole with important information regarding the sport of falconry. In addition, THA actively participates in conservation related projects for raptors and other wildlife, and provides public education on the traditions and practice of falconry. Since its inception in 1980, the THA has grown into one of the largest falconry clubs in the nation. The THA is a product of numerous volunteers who help organize events, conduct outreach in the community, assist beginners and apprentices, and furnish both online and printed publications. The most recent THA volunteers include: Jonathan Millican (Outreach Coordinator), Mark Smith (Apprentice Coordinator), Jimmy Walker (VP), Jay Lehmer (Northern Director), Matt Reidy (Southern Director), Chris Godfrey (Director at Large) and Corey Roelke, (Sec./Treas.). We proudly present On the Wing (OTW), which is our quarterly issued publication. OTW presents a wide variety of articles submitted by practicing falconers from Texas as well as across the nation. True Texas hospitality may be found at several official events hosted by THA. Our Annual Field Meet is major four-day event with renowned speakers and great hunting opportunities. The Summer Picnic is well attended affording an opportunity to share good times and food with THA members during the offseason. There are occasional mini-meets where members gather for less formal interaction and the season ending Texas Sky Trials - a one day longwinging specialty event. By definition, falconry is the traditional sport of taking wild quarry in its natural state and habitat by means of trained birds of prey. It is a hunting art. Statutory requirements for obtaining a falconry permit in the state of Texas include a written examination and a two-year apprenticeship under an experienced falconer. The decision to become a falconer should not be made lightly, thus, the THA provides information about falconry regulations and requirements. Normally, people begin by reading beginner falconry books and casual investigation of the sport. However, becoming a member of THA is one of the easiest ways to join the falconry community. Falconry is a unique experience where humans and raptors share the bond of hunting. A moment's reflection illustrates how falconry can enrich one's life. A day in the field with hawk and dog followed by an evening reminiscing with good friends is typical of many falconry experiences. The awe inspiring experience of falconry was captured by Aldo Leopold when he wrote, "For two and a half cents one can buy and shoot a cartridge that will kill the heron whose capture by hawking required months or years of laborious training of both the hawk and the hawker. The cartridge, as a lethal agent, is a perfect product of industrial chemistry. One can write a formula for its lethal reaction. The hawk, as a lethal agent, is the perfect flower of that still utterly mysterious alchemy – evolution. No living man can, or possibly ever will, understand the instinct of predation that we share with our raptorial servant. No man-made machine can, or ever will, synthesize that perfect coordination of eye, muscle, and pinion as he stoops to his kill." Falconry is a "medium" in that it creates cherished human experiences involving friends and nature which can be remembered for a lifetime. Falconry connects us to nature, but it also connects falconers to its heritage. As of 2010 falconry has been awarded Intangible Cultural Heritage status by United Nations Educational Scientific and Cultural Organization (UNESCO). This recognition is important for preserving the future of falconry and for the continuity with its long history. The cultural diversity and traditions of falconry gives each practicing falconer a sense of belonging to a great world. An important goal for THA is to increase member diversity. Falconry is a healthy activity that can be enjoyed by all. Wise conservation is a guiding principle of falconry. The THA has formed a cooperative relationship with the Texas Parks & Wildlife department to foster a sustainable use of raptors in falconry in a context of legal protection for raptors and access to game species. Promoting and establishing falconry regulations and conservation practices affecting falconry based on science is a long held view of THA. Falconry in Texas at this point is the best it has ever been under the current rules. Texas is among many states that have recently passed a Right to Hunt, Fish and Harvest amendment to the State Constitution. Hunting is now a legal right rather than a privilege. 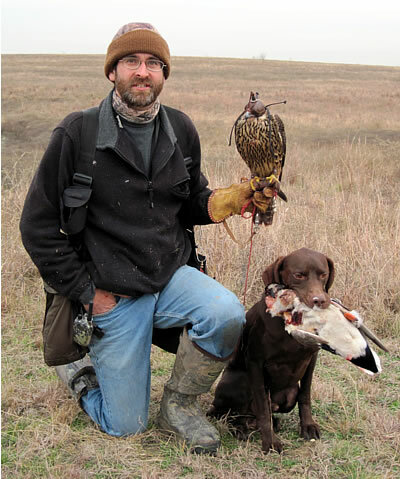 Falconry organizations like the THA strive to improve the rights of falconers in the sport. Joining THA gives a greater voice to the falconry community which helps to ensure the continued practice of falconry in Texas. Additional information is also available on THA's Facebook page. Please do not hesitate to contact me or any THA official if you have any questions or concerns.